The winter winds blow heavy from the northwest in Ellington, Wisconsin, icy echoes of the great glacial retreat that formed the local topography. The dense woods of the early 19th century have given way to farms, large rolling plots where alfalfa and soy, silos and barns spring from the rich alluvial soil. 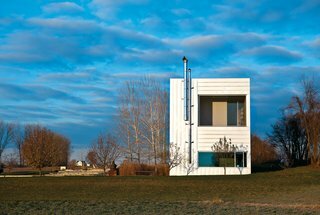 Those local farm buildings—"stoic structures of utility and purpose," architect Wendell Burnette calls them—may have humble forms, but they serve more purpose than storing grain. Oriented with their broad backs to that punishing wind, they tuck homes and porches into their protective shadows.